Brief Biography: I was born and raised in Huamuxtitlan Guerrero, Mexico till I was eleven. I move to East Los Angeles when I was eleven and have lived there since. I have two siblings, an older sister and younger one. They are the love of my life, along with my mother. I am currently majoring in Government with a minor in History at Dartmouth College. I love poetry and literature, I read and write them. I am a proud Mexican and I hope to one day become a great father to my children. Achievements: I received the Dartmouth Class of 2014 award this passed spring during the senior award ceremony. 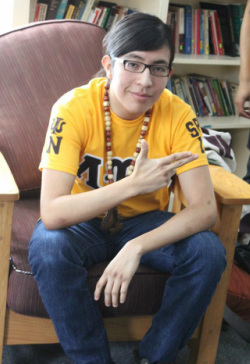 It is a great achievement to have been elected president for MECHA and the Psi Chapter El Norte, La Unidad Latina, Lambda Upsilon Lambda Fraternity, Incorporated. What are you doing now? I am currently embarking in the great that is my junior year in college. I am working in the Native American Program coordinating the Sweetgrass Summer Program for this 2012 Sophomore Summer. I am also looking forward to my Fall Internship with the Summer Enrichment At Dartmouth Program. I pledge because I have a commitment to my community and any individual who has suffer injustice or has lived a life of hardship and struggle because of the structural flaws of society. I pledge to make a change in the Dartmouth community and beyond. I pledge because I believe that if we want change, then we must actively seek and create such change. I pledge because my success consists of contributing my grain of sand to the mountain that is social justice. My favorite moment as an Hermano is every second that I spent with my Hermanos. They are indeed great individuals and make Dartmouth a place worth been at. I also loved our performance in this passed Spring Step Show. We handled that stepping like real bosses. Elite swag all the way! Advice to interested men: Pledging is like life, it is not easy but it is worth it if you truly want it. And remember that a great man is not he who has accomplished the most, but who has helped others accomplish the same or more.